Location On the open, rocky xeric serpentinite slope of Mt. Umunhum's east face. 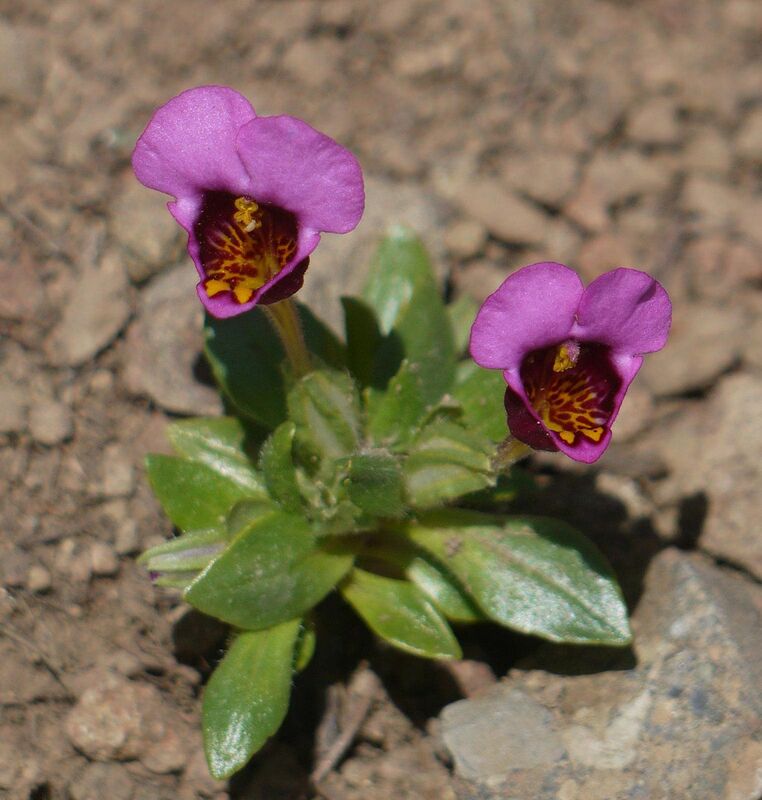 Santa Clara Co.
Notes Fifty+ small annuals, some in bloom with purple corollas, some cleistogomous. On the open, rocky xeric serpentinite slope of Mt. Umunhum's east face. The ground cover is an intricate mosaic of varying densities of rocks, gravel and Selaginella bigelovii. Other associates include: Acmispon brachycarpus, Plagiobothrys nothofulvus, Gilia achilleifolia, Lupinus bicolor, Logfia filaginoides, Avena barbata and Eriodictyon californicum. Though there is extensive similar habitat on the face and across the range, Purple mouse ears were only found in a few scattered colonies in this area, and generally in pockets of loose, gravelly soil or along deer trails. First observed 3/26/2017 by Ken Hiclman. 37.15953, -121.89484; 3,087 ft. Error radius 15 ft; WGS84. Habitat The ground cover is an intricate mosaic of varying densities of rocks, gravel and Selaginella bigelovii. Mimulus douglasii, Mt. Umunhum, Santa Clara Co.